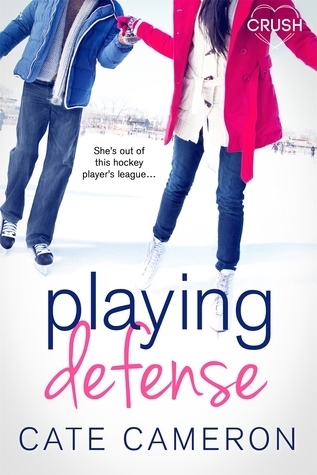 Cate Cameron’s Playing Defense is an adorable novel about life, love, and deciding to be your true self- despite other people’s opinions. Claudia is a bookish, nose to the grind, math girl. She has worked very hard over the course of her high school career to get into the University of Waterloo. However, while she has the grades to be accepted, she doesn’t have the extra curriculars. Her guidance counselor assigns her to be a tutor for Chris Winslow, a star hockey player. As a result of tutoring, Claudia gains new friends, and new experiences through the Sisterhood, a club set up to challenge each other to be better people and breakdown their own barriers. Claudia is quirky and weird. She faces a lot of trials in Playing Defense. She learns to over come her own shyness. She has to decide if she wants to be the quiet, bookish girl she’s always been, or, become the outgoing girl she wants to be. Part of this challenge, and the coming of age theme, is facing her parents. While she is changing from a caterpillar to the beautiful butterfly, Claudia’s parents believe it is the influence of Chris and her new friends, not of her own decisions. Her parents have a difficult time handling her interest in Chris as a possible boyfriend and believe he is no good for her. Eventually, they do get to her, but she is able to face them and be the “Dia” she wants to be. And while yes Chris is quite lazy, and the reason he needs a tutor, Claudia and Chris help each other grow and realize they can accomplish, and be, so much more if they just try. Trying is the key to this story. Trying new experiences. Putting effort into your work, whether it’s school or sports. Being your true self. I’d like to thank NetGalley and Entangled Teen for the opportunity to review with ARC. Receiving this ARC for free in no way influenced my review.